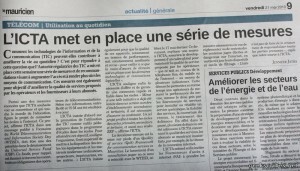 Internet Filtering Coming To Mauritius Soon? I have found an interesting article coming from Le Mauricien newspaper of Friday 21st of May. You can see a shot below. It deals with some measures ICTA (Information Communication Technology Authority) wishes to introduce or see implemented. While some are laudable, such as promotion of ICT as education tools and enhancing performance of communication systems, the last part of the article ticks off my Paranoia Alarm. The shot of the scary paragraph, with highlighted portions can be seen below. Well, what do I see? 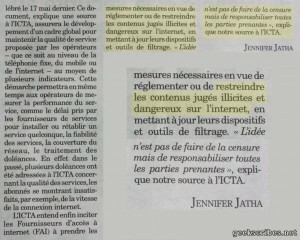 ICTA wants to implement Internet filtering in Mauritius. I remember Ex-President, Mr. Cassam Uteem’s wish to see some pages of Facebook blocked due to some offensive content. There have also been past instances of Facebook being blocked in Mauritius, for example, due to the usurpation of our PM’s identity to create a profile. These cases may have warranted a blocking of the incriminating pages, but I doubt censorship was the only possible solution. Now imagine if our local politicians or authorities have the power to block sites at a whim. Tomorrow, Mr. X doesn’t like a parody video of his speech on Youtube, and the site is blocked? No thanks! Something strikes me as funny in this article: “the idea is not to implement censorship”. Can somebody enlighten me about the difference between “filtering” and “censorship”? I thought that content that was filtered out was censored. Am I wrong? Giving censorship powers to a Government is too much in my opinion. The Internet should be a free-flow of information, and not to be controlled by anybody. I agree that there are some content that deserve censorship, but I believe it’s best left to its users to know what should be accessed and what should not. Such situations exist in real-life too. There are some places in cities where it is dangerous to go. However, I do not see any barriers erected to prevent people, especially children from going there. So why should this apply to the Internet? If parents do not want their kids accessing unauthorized contents, well, they can be educated into how to implement filtration software on their machines locally. Or make the government-filtering opt-in. So people who want to see the Internet filtered can install software locally to do the job, with the use of a Government-managed database. Others can continue using the Internet as they see fit, taking their responsibilities if ever they are caught doing nasty stuff. On a side note, we see the Internet from the social and crowd aspect nowadays. You have social networking, social bookmarking, social music discovery, social-tea-making, social-what-not. Why not social filtering? I have no idea how this would work, but hey, we do democratic voting to elect out leaders, we could do some democratic voting on what we want off the Internet too right? Seacom goes live, connects Mauritius? Summer time in Mauritius: Pointless? It all depends on the nature of those “contenus jugés illicites et dangereux”. Of course, blocking facebook because someone created an account under the name of navin ramgoolam was far fetched. But here, I find that the authorities were incompetent. It was like blocking the whole internet because a web site was illegal, pff. Don’t they have an option to block only a url? or they simply don’t know how to do it? Who said Mauritius was a free and fair country? No it isn’t. Bienvenue a la Chine! Ban la pe rod fer couma la Chine, l’Iran ek l’Australie. 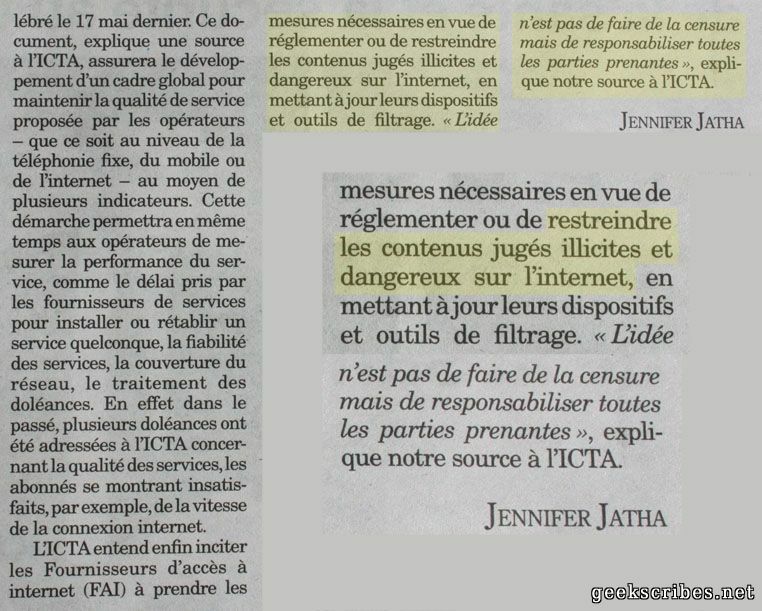 Si filter ziss materiel pornographik, li ok … mais pas ban content politik. @Yashvin: I don’t like censorship. Even blocking that single URL is too much. There’s a Report link on FB. There’s also an Abuse email they could have used. Hell, they could have phoned FB’s HQ and ask to have the profile removed only on the grounds of usurpation of identity. @Bruno: If someone wants to see pr0n blocked, they implement filtering tools locally. Or as I said, make the filtering opt-in when you sign in with your ISP. Why censor some content which you find inappropriate, when others could find it acceptable? Is this not a violation of their freedom?